52003-49ER-Pink NFL Team: San Francisco 49ers – Pink Features: -Tote bag.-Authentic NFL team league.-Faux leather and satin like quilting.-Shell: 80pct Polyester, 20pct PVC.-Lining: 100pct polyester.-Two interior pockets.-Hand wash, line dry, do not iron design. 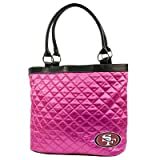 Dimensions: -Faux leather 8” handle drop.-Dimensions: 12” H x 16” W x 5.5” D.
This entry was posted in Sports Kits and tagged 49ers, Francisco, Pink, Quilted, Tote by All Kits. Bookmark the permalink.